* ed. note: full version original appeared at TPC in 2011; abbreviated version had previously run in About Covington in 2010. 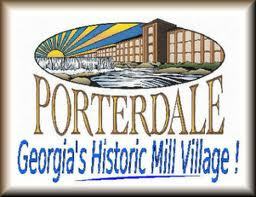 Porterdale’s roots go all the way back to the early part of the 19th century. Back then it was a community called Cedar Shoals and may have also been referred to as Boston before that. The area would continue to be known as Cedar Shoals until it was incorporated as Porterdale in 1917. The town was named in honor of Oliver S. Porter who was in many ways the father of this town; however, to backtrack a bit, the grandfather of the town would have been Noah Phillips, a transplanted Connecticut man, who purchased several acres near Cedar Shoals in 1831 in order to start a wool and cotton factory. Over the years different owners and operations woul d come and go until the aforementioned Mr. Porter took over the Cedar Shoals operation in 1869. Expansions and growth with the company and the city would continue over the next several years. Just as Oxford had a shared history with Oxford College, so did Porterdale with the factory. 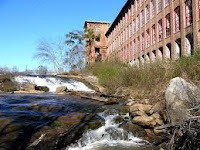 In 1898, a Macon outfit, Bibb Manufacturing Co., took over ownership of the Cedar Shoals Mill after having built their own mill about a decade earlier on the other side of the Yellow River. Back in the earlier days, Oliver Porter married Julia Camp, who had been married to a Charles Camp before he passed away in the mid 1860's. Mr. Camp owned half the shares of the mill at the time that Porter would take over after he wed Julia in 1869. Julia already had a daughter with Camp, and the Porters would go on to have four children of their own. All of the Porter kids (excepting Mary, who died young) would go on to college at Emory and return to their native town in order to help the family business. In particular, their oldest son John was very instrumental in helping to build a school for the town and also to start bringing in medical care for the burgeoning mill village. One of the ot her sons, O.W., became the manager of the village general store. Both John and O.W. remained very much involved and active with the town through the years. several other cities including Macon and Columbus. In 1920, a newspaper was started up called The Bibb Recorder which served all of the cities that Bibb had mills in. The paper had a 50 year run that ended in 1970. Ask anybody around who lived or was raised in Porterdale back in the day and they'll no doubt tell you how important the Recorder was. As the operations for Bibb grew through the 1920's and 30's more and more improvements were made to the city. Multiple schools were built in order to better serve the educational needs of the area. 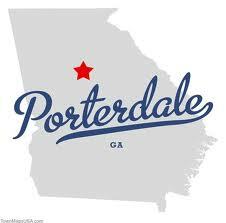 The first graduating class of Porterdale High School commenced in 1939. 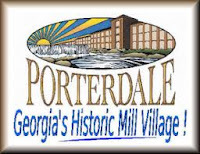 In addition to multiple stores, businesses, social clubs, and other things of the like, Porterdale even had its own hospital during this time. In fact, my wife's mother was born at that hospital as were countless other folks throughout the years. Throughout the 50's & 60's, the Bibb Mills employed upwards of 2500 people. During the early part of the 20th century, the company actually owned most of the quaint houses one will see in Porterdale, but by the 1960's, those houses were starting to be sold to the workers. Eventually, Bibb closed down their operations and the town fell off a bit; however, over the last decade, Porterdale has had quite a resurgence. At the center of this is the lofts that have been developed at the mill on the north side of the river and the remodeling of the downtown business district. The future looks very bright for Porterdale, GA!